The entry for just a few days ago—March 14—marks the date that the first National Wildlife Refuge was created, in 1903 (see more here). But 33 years earlier, on March 18, 1870, the nation’s first wildlife refuge was created. What’s the difference? This one was enacted by the State of California, not by the federal government. The first wildlife refuge is Lake Merritt, in the middle of downtown Oakland, California. The Lake Merritt refuge includes a 155-acre lake and the surrounding parkland. California declared on March 18, 1870 that “it shall be unlawful for any person to take, kill or destroy, in any manner whatever, the grouse, any species of wild duck, crane, heron, swan, pelican, snip, or any wild animal or game, of any kind of species whatever, upon, in or around Lake Merritt…and within one hundred rods from high water mark….” Hence, a wildlife refuge! 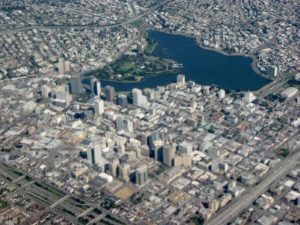 Lake Merritt started out as a tidal lagoon, known as Laguna Peralta, that was fed by the adjacent Oakland estuary. Seven small streams emptied into the wetland from upstream. It was an important resting point for migratory waterfowl traveling the Pacific flyway. 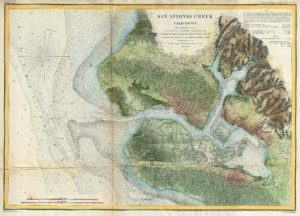 In 1869, the mayor of Oakland, Samuel Merritt, donated the lake and surrounding area to the city for a wildlife preserve. He was interested in encouraging the development of the adjacent lands and so wanted to stop hunting that he thought discouraged investment. He also donated funds for construction of a dam across the tidal inlet, with culverts that could control how much water flowed in and out of the lagoon. Henceforth, the lagoon became a saltwater lake—the largest of its kind in an urban area in the country. With ongoing urban development, the lake required additional management. Today the lake is surrounded by retaining walls along the entire 3+ miles of its perimeter. An island for waterfowl nesting was built in 1925 and four others followed in the 1950s. The largest have freshwater ponds. These islands are cordoned off from people during nesting times. Water flow was carefully managed to keep the lake surface at a level compatible with the surrounding urban uses. Historic photographs show huge flocks of waterfowl. For several decades the birds were fed twice daily, no doubt artificially increasing the carrying capacity of the habitat. With decreased tidal flushing, the lake slowly became filled with silt and has required dredging on occasion. High nutrient inputs have also led to eutrophication. In 2002, the City of Oakland passed a $198 million bond issue, with $115 million allocated for the restoration of Lake Merritt. A series of 50 projects were performed to restore the estuarine connections more directly by removing the old culverts and allowing natural tidal movements. Other projects sought to improve water quality in the lake, restore incoming streams and marshes, and provide for more pedestrian and bicycle use while reducing vehicle traffic. Lake Merritt is the epitome of an urban park. The lake and adjacent lands have been developed extensively for outdoor recreation, both associated with nature (a nature center is located on the property) and with cultural and fitness activities. Whether the park has fulfilled its goal as a wildlife refuge is probably debatable, but its value as a nature-based asset to the local community is outstanding. City of Oakland. Lake Merritt, The Jewel of Oakland. Available at: http://www2.oaklandnet.com/government/o/opr/s/LakeMerritt/index.htm. Accessed March 16, 2018. Lakemerritt.org. Welcome. Available at: https://www.lakemerritt.org/. Accessed March 16, 2018. Miller, Amy. 2010. Polishing Oakland’s Crown Jewl: Lake Merritt Reborn. KQED Science, August 20, 2010. Available at: https://www.kqed.org/quest/7406/polishing-oaklands-crown-jewel-lake-merritt-reborn. Accessed March 16, 2018.